Welcome to the Synersteel Museum. This is a collection of all of the games created at Synersteel over the years, to show just how far we've come. Time Gem was when we sat down and finally said, "Enough is enough!" We had talked about making games for years, but talk is cheap, and it was time we finally took action. This game began as a tutorial and soon developed into something of our own making. 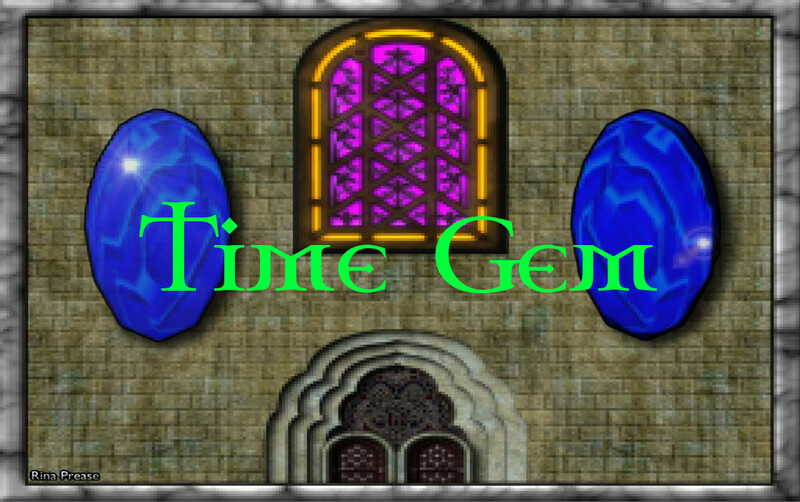 We originally had much grander plans for Time Gem, but once we realized just how inexperienced we were, we decided to wrap things up and move on to another project. We wanted it to be a full-fledged RPG, but after the first two months we only had a party system and combat system working, and the amount of work that would be required to finish it completely was daunting. So we decided to move on to Light Maze. That's not to say that Time Gem did not have its benefits. It was our first game project, and we learned a tremendous amount from it. Both in terms of development as well as planning, because our scope was way too grand for our team at the time. But it got us started on our path to game development, and what more can anyone ask for? Light Maze was a game we had planned for years, but never actually had the know-how to achieve it. After finishing our first project, which was way out of scope, we decided to get realistic and actually finish Light Maze, the simplest game we had in mind. Simple, yes, but certainly not easy. The few people who we did get to playtest Light Maze commented on how difficult the levels got about halfway through, taking them upwards of 10 minutes to complete a single level. We were quite proud when we finished Light Maze, as it was truly a sign of good things to come. By itself, it is not very remarkable, but as part of the bigger picture, it signifies our first step toward being actual game developers. We set out with a game in mind, fleshed it out, and fully implemented it, including all code and art. It gave us a great confidence boost that we've had with us ever since. Calculated Risk was our first attempt at making a game that was actually fun . All the previous games were simply getting our feet wet with development, learning its ins and outs, and we finally decided enough was enough and that was would make a game that people might actually want to play. We were fairly successful in what we set out to do. We got mostly positive responses from everyone we sent it to - which is another area where Calculated Risk was a first, we actually get people to playtest the game. We received a ton of valuable feedback, and took note of all of it in the event that we ever decide to go back and improve upon the game. When all was said and done, we consider Calculated Risk to be a huge success. It was only our third game and we completed it entirely in a single month. There was a ton learned, a lot of optimizations that could have been done in hindsight, but it worked, it was challenging, and most of all, we really enjoy playing it. Spell Bound was our first journey into mobile development, as well as the first game that had more than two people involved. It grew organically as the project went on, starting with only three people involved in its development and ending with five, plus a couple of beta testers! It really has been our biggest project to date, and we've taken everything that we learned from previous projects and applied it to Spell Bound. Things really started to come together in the final weeks of the project, when all of the art and code came together flawlessly, with the NPC's dialogues topping everything off. Up until then it felt like just an action game, but when the world came to life it felt more like an RPG. We were unsure whether we wanted to charge people to play the game or release it for free, but after 3 months of pouring most of our free time into it, we decided to release it for $0.99 on Google Play. After a rough reception, we decided it was better to let people download it for free. For Stratewarz, we wanted to do something different. Before beginning work on it, we planned it out to be a simple multiplayer turn-based combat game in which you could customize your army with different spells and equipment. The final result was anything but simple, and we learned a hard lesson about scope. It turned out, multiplayer was much more difficult to implement than we thought, and as a result the game looked really great but had clunky controls and gameplay. We did manage to pull through and finish the game, releasing it to close friends as a beta version, but never went back and polished it. One of the beneficial aspects of Stratewarz was that we expanded our team temporarily, and got some really great tunes from our close friend Chris Maguda. We got our first taste of actual team collaboration, which was a great learning experience. Xeno was meant to be a 2-player co-operative FPS, and it was our most ambitious project by a long shot. The plan was to emphasize co-operation with a friend, rather than simply 2 people playing the same game together. Unfortunately, many factors played a role in Xeno never seeing the light of day. To name a few (the most influential ones): switching to a new technology (from Unity3D to Unreal Engine 4), underestimating the difficulty of implementing networked play, and not staying on top of scope creep. However, Xeno was not a completely wasted project. There were many things learned by all members of the team (and during the development of Xeno, we had 7 people working on the game). While there is no actual product to show for our months of toiling, we believe it was a mis-step that was necessary for us to really understand where we want to go as a development team. Thank you for visiting the Museum!